Assist and interact with our clients who work in our center-based workshop at the Elmore Center. Spend time with our clients who have chosen to spend their weekdays engaging with the community and doing volunteer work. Show off your artistic abilities and brighten a Meals on Wheels client's day at the very same time. Decorate a Meals on Wheels lunch bag (*specific size) or make crafts for seniors. A variety of crafts are accepted such as bookmarks, cards, tray favors, and small crafts. The crafts are delivered daily to seniors who receive Meals on Wheels. All ages welcome! A virtual opportunity from home, work, or school. Service hours are available for students who decorate Meals on Wheels bags or create crafts. Service hours are awarded based on the quality and quanity of items donated. Bag size: We utilize a larger paper sack, than the traditional lunch bag purchased at the store. You can purchase the bags at Walmart Target, Sam's Club, or Amazon. They are called GIANT (at Walmart or Target). The size requirement is 6 1/8 in x 4 in x 12 3/8 in. Please do not use the smaller bags as the meals will not fit in the little lunch sacks and we will be unable to award service hours. * Lastly please ensure that the items are prepared in a clean sterile environment. Do not place the items on the floor at any time, as the bag will contain the meal, and we want to ensure all items are sanitary and germ free. Assist our Emerging Artists program with creating and selling art as a way for them to earn income doing something they love. Create and lead lessons for weekly English Language Classes. Assists customers in finding items they are looking for. Monitor tables to ensure they are fully stocked. Keep tables neat and orderly. Sign-up today to show your interest, and then starting May 1, 2019 you may come back to sign-up for a specific shift. Sizzlin' Summer Book Sale! June 27-29, 2019: Assist the Friends Book Sale Team starting one week before the sale. Includes organizing and ordering supplies as needed, preparing the Volunteer sign-In Table, setting up tables, unpacking sale items. Sizzlin' Summer Book Sale! June 27-29, 2019: Must be at least 16 years of age. Must be comfortable using the Square Point-of-Sale system at the time of the book sale (Training may be completed prior to the book sale). Previous experience in cash handling preferred. Sizzlin' Summer Book Sale! June 27-29, 2019: Watch shoppers and offer to assist them in carrying their purchases as they browse. Offer to bring books to a table to hold for them. Assist shoppers in bringing their items to the cashier. Offer to bag or box items and take them to their car. Sizzlin' Summer Book Sale! June 27-29, 2019: Sign-up here to help wherever you are needed! Several shifts available at our Blue Valley and Central Bookstores. Also need substitutes to cover shifts on short notice at Antioch, Blue Valley and Central Friends Bookstores. This opportunity is for those 16 years of age or older. Do you like assisting people with tasks they can no longer do around the home? Are you looking for a weekend volunteer opportunity? Helping Hands may be the perfect opportunity for you. Human Services is looking for volunteers 16 years of age and older who can assist with lawn mowing, weed pulling, and general yard clean-up. The volunteer must supply their own lawn mower. The client is responsible for lawn bags (if applicable). This is a one time volunteer opportunity per client per year. The volunteer is not responsible for on-going yard support. Volunteers must attend a general orientation and complete a criminal background check. Must attend a general orientation and complete a background check. Help stock the shelves at one of the County's food pantries. Service hours awarded to students who collect at least 50 full size items. For every 50 items collected, the student will earn five service hours. Johnson County Human Services - Multi-Service Centers provide services to low income residents. We provide services such as utility assistance, food pantry, provide vouchers for the Kansas City Medicine Cabinet, and case management. We operate three food pantries in Johnson County: North Central (Lenexa), North East (Mission), and Southwest (Gardner). We collect non-perishable food items such as peanut butter, oatmeal, cereal, jelly, canned fruit, helper meals, canned tuna & chicken, canned vegetables, beans, soup, canned pasta, and pasta sauce. *Due to safety regulations, we are unable to accept expired food. Service hours will not be awarded to expired food items. Donations can be dropped off (Monday - Friday 8 am - 5 pm) at our Olathe office located at 11811 S Sunset Drive SUITE 1300 Olathe, KS 66061. Interested in volunteering for Human Services but uncertain where to start? Attend a volunteer orientation. General orientation is a one hour overview of the services provided by Human Services and ways you can volunteer. To get started with one of the above opportunities, you must attend an orientation session. Orientations are hosted twice a month. During the orientation you will complete all neccessary paperwork to volunteer. Weekday opportunities available from 8am-5pm. If interested in joining Catch-a-Ride or Meals on Wheels, please plan on staying an additional hour for program training. The program training is from 2 pm - 3 pm. Assist the InterLibrary Loan Department with clerical tasks. Must be comfortable using a computer (training will be provided). Must be comfortable working independently after training is complete. Preferred schedule is any time on a Thursday. Processing returned borrowed items in computer software program. Opening a portion of our incoming courier mail. Sorting, putting away packing materials. Printing, cutting, and filing new courier shipping labels. Need More Information? Or want to be in a Substitute Pool? If you don't see the volunteer position you're looking for, or you aren't sure about where you want to volunteer, you've come to the right place! 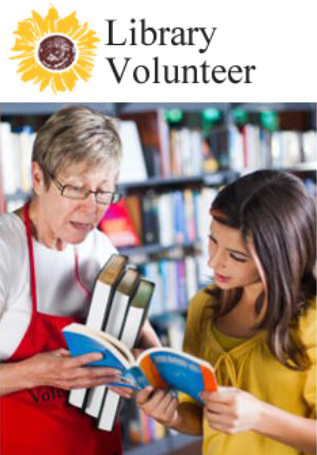 Sign up here and you will be contacted to learn more about volunteering in the library! Assist our clients in the Papercrete Works program who earn an hourly wage for pouring Papercrete into molds, decorating it when it is dry, and selling decorative items as a way to earn income. The "Now Presenting" Program will be meeting at Central Library on the third Tuesday May through August 2019. Volunteers are needed to set up chairs and tables for the program. It requires set-up one hour before the program, providing support during the program (refill water, coffee, assist presenter as needed), and stack chairs, fold tables and put them away after the program. The Writers United Program will be meeting at Central Library on May 1, June 5, July 10, and August 7 from 6-8 pm. Volunteers are needed to set up chairs and tables for the program. It requires set-up one hour before the program, providing support during the program (refill water, coffee, assist presenter as needed), and stack chairs, fold tables and put them away after the program. 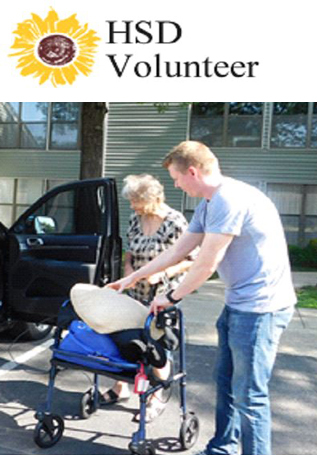 We always need volunteers who want to spend time with our folks in Retirement. You can bring an activity or something to share, or accompany our group on a community outing. 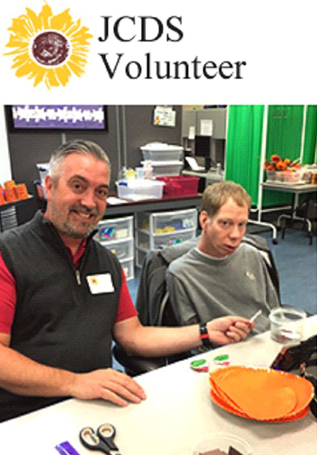 VOICES is a program created by JCDS that will pair a volunteer from the community with someone receiving services for an intellectual or developmental disability. The goal is for the pair to spend time in the community doing an activity, volunteering somewhere together or socializing. Assist the Volunteer Services Coordinator with data entry. Must be comfortable with technology and able to work alone. Schedule is flexible. Volunteers like you help your Library with 60,000 hours each year.